Concrete may be one of the world’s oldest construction materials, but innovative new techniques are making this familiar substance one of the hottest elements in backyard barbeque design today. The tremendous design flexibility and functionality of decorative concrete distinguish it as a surface of choice for outdoor kitchens. 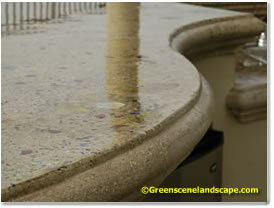 With a little planning and imagination you can design a one-of-a kind outdoor countertop to suit your style and budget. Homeowners and outdoor designers both love decorative concrete for the graceful contours, convenient enhancements, and artistic embellishments it allows. This flexibility is made possible by techniques like the cast-in-place process that my team and I use in our landscape design and construction firm, The Green Scene. There are many foam forms that are inexpensive and easy to use to create awide variety of different concrete countertop edge shapes, colors, and features to fit the needs and reflect the styles of individual homeowners. Using this method, concrete can accommodate almost any curve. It can be designed with cantilevered edges for bar stools or even crafted into a full-size dining table with a built in umbrella stand. It can be embellished and embedded with decorative stamping, colorful glass mosaics, or stone. It can even be cast with artwork or artifacts that make a unique statement about you and your family. 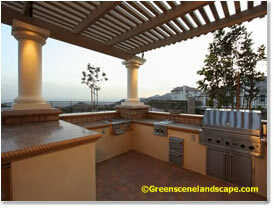 There are several things to consider when planning concrete counters for your outdoor kitchen or barbeque. Remember that counters can be uniquely designed around the activities they’ll be used for. To take full advantage of this benefit, you’ll want to think carefully about how you use your outdoor space and talk with your designer about your needs. This will ensure that the result is an efficient and beautiful space that suits your own outdoor cooking and dining style. When it comes to eye-appeal, small touches make a big difference. Take advantage of the fantastic array of design possibilities that concrete allows. Counters can be created with mantle or bull-nose edges that have a substantial, upscale look. They can be dressed up with a raised backsplash or a veneer of flagstone, slate, or tile. Colorful glass mosaics can add an elegant statement or a dash of whimsical sparkle. Built-in low-voltage lighting beneath the counter creates a dramatic effect that gives the entire barbeque center a warm ambience after dark. What about maintenance? This is one area where concrete really shines. Conventional tile counters require quite a bit of maintenance including regular grout cleaning. Homeowners often find that they quickly look tired and out-of-date. Concrete counters on the other hand are nearly maintenance free and are very easy to keep clean. Concrete counters do not have the many grout lines that tile counters are plagued with. The lack of grout lines makes concrete counters easier to seal and keep clean than tile. Simply wipe with warm water or a mild, non-abrasive cleaning solution. To further enhance the convenience and serviceability of your barbeque center, remember that there are a variety of features that can be incorporated into the design. Stainless steel drop-in ice chests, built in paper towel holder drawers, drop-through trash chutes, sear zones, built in wine racks, warming drawers, and outdoor storage doors help create a barbeque center that’s as satisfying to work in as it is to look at. All of these details work together to create a beautiful, distinctive barbeque center that’s an inviting place to spend time with family and friends.